What a treat to arrive back in Paris and have the markets be full of lush, juicy strawberries. Seeing the berries always inspires me to make some extravagant strawberry dessert. But, applying heat seems to pollute the flavor and render them mushy and stingy. A good strawberry is best enjoyed with the simplest of preparations. 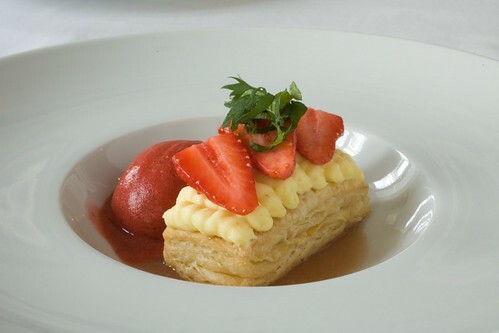 Sorbet seemed like a natural thing to do, served with puff pastry, pastry cream and some fresh unadulterated Gariguettes. With a little Japanese inspiration, I added some shiso. The powerfully herbal and vegetal quality of shiso complements the berries beautifully.